I see vultures outside of my Florida home nearly every day as they circle the skies and search for their next meal. 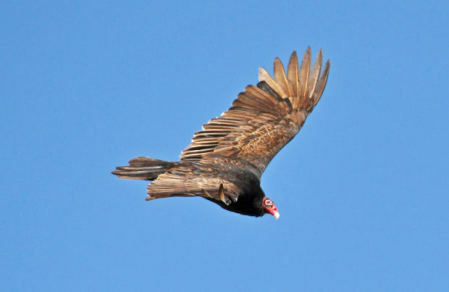 They’ve never bothered me and I can’t think of anyone who’s complained about the resident turkey and black vultures, but my easygoing road pizza aficionados obviously don’t match the hundreds of vultures roosting in the suburbs of New Jersey. While the vultures aren’t directly interacting with the concerned residents, their corrosive and foul-smelling feces are damaging property and their daily roosting habits are tearing at rooftops with their sharp talons. Other citizens are simply unnerved from seeing dozens of three-foot-tall predatory birds lined up on neighborhood roofs. While the solution is a bit on the morbid side, the results speak for themselves. It is illegal to capture or kill vultures in the United States, and only licensed officials are permitted to handle and hang the dead birds. The turkey vulture has an extremely expansive range that stretches from the tip of South America all the way to southern Canada. However, these migratory birds only stay in the northern regions of North America during the summer months. 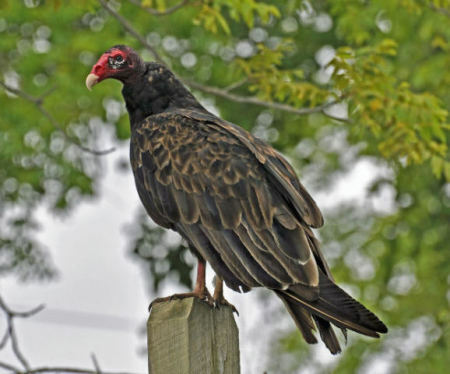 Turkey vultures mostly eat carrion (dead animals), and is known to reliably raise two chicks each year.